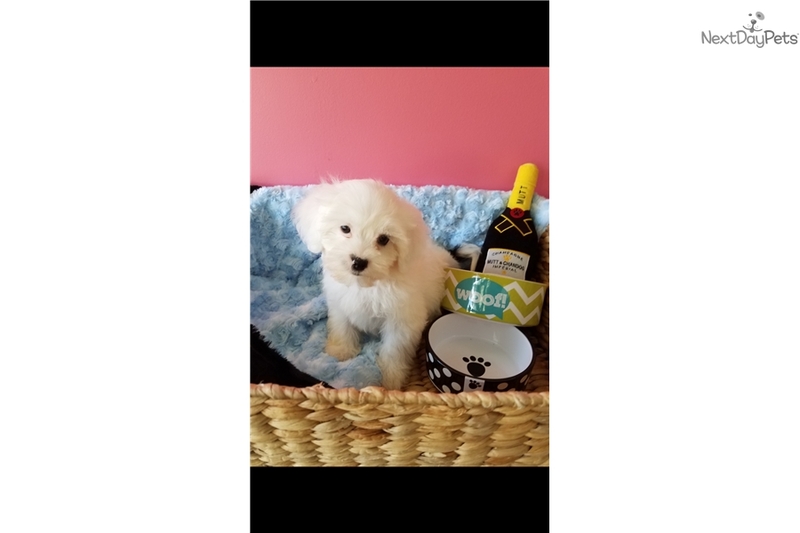 This Shih-Poo - Shihpoo nicknamed Stone sold and went to a new family. The Toy Poodle is remarkably intelligent. Highly responsive, it is said to be one of the most trainable breeds. Sweet, cheerful, perky and lively, it likes to be with people. Delightful, very amusing and keen. Socialize these dogs well. They make very good watchdogs for their size. Toy Poodles are generally good with other pets and dogs. This little dog can be good with children, however is usually recommended for older children who know how to display leadership skills. Make sure you are your dog’s firm, consistent, confident pack leader, providing daily mental and physical exercise in order to have a trustworthy, mentally stable dog. Toy Poodles are good for city life as well as country living. Given enough exercise, they are not active indoors. They will lie right next to you and are more sedate when indoors, although they love to play outdoors and are a highly intelligent breed, so they do like lots of thoughtful activities to stimulate their mentality. They will do okay without a yard. These are active little dogs that need a daily walk. Play will take care of a lot of their exercise needs, however, as with all breeds, play will not fulfill their primal instinct to walk. They will also enjoy a good romp in a safe, open area off lead, such as a large, fenced-in yard. Poodles shed little to no hair and are good for allergy sufferers. The Shih Tzu is an alert, lively, little dog. It is happy and hardy, and packed with character. The gentle, loyal Shih Tzu makes friends easily and responds well to consistent, patient training. It makes a very alert watchdog. It is courageous and clever. Playful and spunky, this affectionate little dog likes to be with people and is generally good with other pets. Take it for daily walks to burn mental and physical energy. Its temperament will improve for the better, and you will bring out the sweet, trustworthy dog in it. The Shih Tzu is good for apartment life. These dogs are fairly active indoors and will do okay without a yard. This breed is sensitive to the heat. The Shih Tzu needs a daily walk. Play will take care of a lot of its exercise needs, however, as with all breeds, play will not fulfill its primal instinct to walk. Dogs that do not get to go on daily walks are more likely to display behavior problems. They will also enjoy a good romp in a safe, open area off lead, such as a large, fenced-in yard. Do not overfeed this breed or it will quickly become fat. This breed sheds little to no hair and is good for allergy sufferers if its coat is kept very well groomed, due to the fact that they shed little skin dander.